A dynamic approach to addressing muscular imbalances that can reduce or eliminate pain and fatigue as well as speed muscle recovery, Muscle Activation Techniques™ (MAT™) isn’t as much therapy as it is exercise. Essentially, MAT™ reestablishes the proper neuromuscular function in our bodies by getting muscles to fire properly again. Think of it as a circuit board … you could have a brand new bulb, but if the electricity is somehow blocked and doesn’t get to it, nothing happens. Instead of getting muscles to relax, MAT™ is about getting muscles to contract properly while improving stability and strength. It’s about trying to release tension, increase range of motion and retrain the neuromuscular system to work properly and harmoniously. The idea is that in doing so, these muscles provide stability. The principals and effectiveness of Muscle Activation Techniques™ (MAT™) is not new. As a matter of fact, elite athletes around the world have been embracing its benefits in addressing muscular weakness, tightness, and injury to improve their performance, proving the method is becoming more prominent in the strength and fitness field as well as improving everyday activities for all age groups and body types. The Roskopf Principle, on which MAT™ is based follows the notion that flexibility is a derivative of strength. Muscle tightness is secondary to muscle weakness. A limitation in motion is an indicator that one or more of the muscles that cross that axis cannot contract efficiently. When a muscle or group of muscles cannot effectively shorten, the muscles on the opposite side of the axis cannot fully lengthen. This inefficiency in muscle contraction is expressed as muscle tightness. MAT™ allows the body the ability to achieve optimal levels of function, without further discomfort or injury by increasing the body's range of motion, restoring muscular alignment and eliminating compensation patterns. It leverages a checks-and-balances system designed to identify and address the causes of discomfort and range of motion limitations. What to expect from a MAT™ Session? We start out by identifying asymmetrical and limitations in your range of motion. 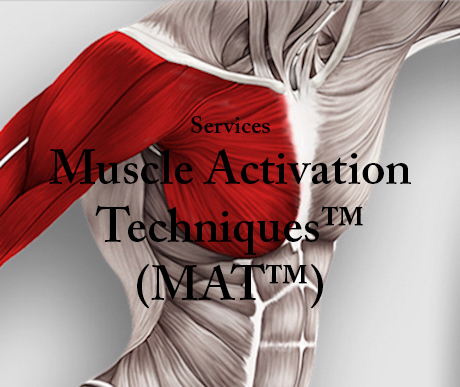 Muscle Activation Techniques™ addresses the muscles that lack the signal strength to move the bones into the position. The MAT Specialist then evaluates each muscle to determine if there is proper neurological input. This testing is an indicator to see the muscle’s ability to react to the resistance applied by the practitioner. It lets the practitioner know if the muscles can respond to forces applied in everyday situations. Isometric Contraction involves light contractions by the individual with very specific force and positioning. The MAT™ Practitioner applies a specific force perpendicular to the individual’s muscular attachment for a few seconds. This stimulates sensory receptors that in turn increase motor neuronal activation to the muscle associated with that attachment. This is the checks and balances system of MAT™. The practitioner reassesses the Active & Sustain Assessment Tests. Once all muscles involved in Step 1 have been treated, we then retest the Range of Motion.